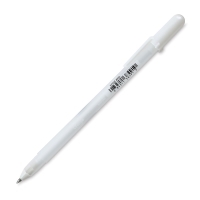 This is the first pen of its kind to create glossy raised images and lettering without applying heat! 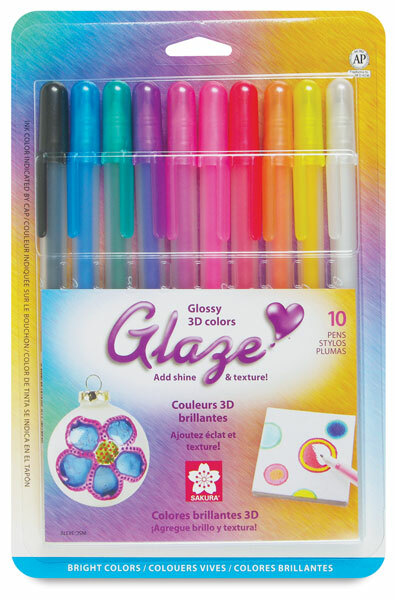 Sakura Glaze Pens add funky 3D accents to cards, scrapbooks, invitations — even non-porous surfaces such as plastic, coated papers, acetate, vellum, ceramics, glass, and metal. 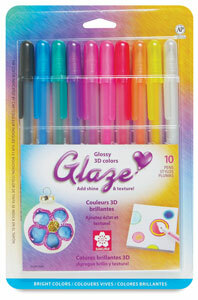 For a beautiful stained glass effect, use Glaze Pens on translucent or transparent surfaces. This water-resistant ink can also be used to create batik effects, or to add accents to rubber stamped images. The shiny colors and raised texture look and feel like heat-embossed images, without the fuss! Just apply and allow to air-dry for 45–60 seconds. 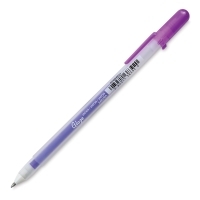 The line width is 0.7 mm. Set of 10 — This set includes one each of Black, Blue, Green, Peach, Pink, Purple, Red, Rose, White, and Yellow.